The specimen shown here is one of some 100 fine examples of precious opal from the mineral collections of the Science Museum of Minnesota. It was collected from the sedimentary rock layers at Lightning Ridge in New South Wales, Australia. Other Australian opal fields at Coober Pedy and Andamooka in South Australia have also yielded precious opal specimens for the museum's collections. This opal weighs 11.25 grams (56.25 carats). 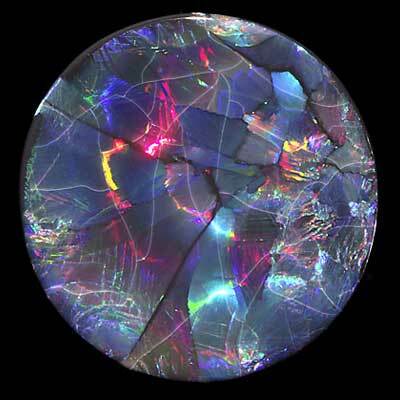 As with all precious opal, it is composed of many microspheres of silicon dioxide with small amounts of water in the spaces between these microspheres, as well as traces of other elements and compounds. The uniform size, shape, and arrangement of these microspheres split incident white light into the emerging color rays that we see when looking at an opal. This phenomenon is called "Play of Colors" or "Opal Fire." Additional views of opal G91.1 showing the play of colors.